It's hard to believe the sand wedge was invented less than 80 years ago. Look at the plethora of wedges available now (regular, gap, sand, lob) and the materials they are made in (steel, copper, bronze, and titanium). Not to mention the lofts, lies, and bounce angles, and of course all the shaft options -- it's enough to boggle the mind. Obviously, it's possible to dial up a wedge to suit any level of game and handicap, and to address virtually any condition found on a golf course. While the Nike SV Tour Wedge is just one among thousands, it bears a close look from any one in the market for a new wedge to compliment their game. 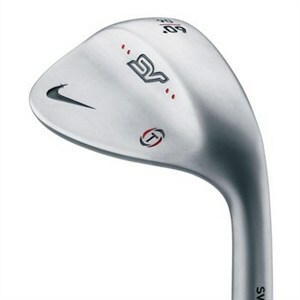 Nike polled their Tour Staff members, and the resulting feedback and suggestions went into the creation of the SV Tour wedge. Among other things, the profile, bounce, and groove contour are all Tour caliber. The SV Tour wedges have classic (e.g., simple) profiles and sole grinds which provide a clean look with a lot versatility. Using a CNC milling machine to create a flat face will -- Nike claims -- provide a consistent golf ball response off the club face for more accurate golf shots. When you combine these features, they are bound to provide a greater degree of control, confidence, and accuracy necessary for a solid short game. Having confidence in your wedges is one of the key elements to their successful application. I've tried all manner of wedges over the years, from the most basic Sam Snead model to the gimmicky stuff advertised at 3:00 a.m. on The Golf Channel. After all the wedges I have tried, the ones that consistently perform the best are the high quality, tour proven options. The Nike SV Tour comes in a wide variety of loft, lie and bounce options -- from a Strong Gap Wedge at 50 degrees to a Lob Wedge at 60 degrees, and several in-between, there is a combo available to suit most any need. Even the shaft option is simple: True Temper Dynamic Gold in regular flex. This is a handsome club as well with a satin chrome finish to the head and simple, yet elegant, markings. If nothing else, you'll at least feel like a Tour Pro pulling one of these from your bag.